In accordance with Art. 13 of the European Regulation 2016/679 (GDPR) and with Provision no. 229 of 8 May 2014 regarding cookies, we wish to inform visitors to the site about the use of the data entered and the cookies used by the site itself. The information is also provided pursuant to Recommendation no. 2/2001 adopted by the Working Party established by Article 29 of Directive 95/46/EC. This document concerns the websites and landing pages of Pejo Funivie S.p.a. and does not concern other web pages that may be consulted via links. This is information that is not collected to be associated with identified parties, but by its very nature could, through processing and association with data held by third parties, allow users to be identified. This data is only used to obtain anonymous statistical information on website use and to check the proper functioning of the same. It is deleted immediately after processing. This data could be used to ascertain responsibility in the event of hypothetical computer crimes against the site. This information refers to data provided voluntarily by the user. • CONTACT US: we inform you that the data provided will be used exclusively to respond to requests. The data collected will be kept only for the time necessary to provide you with feedback. This processing is carried out on the basis of your consent. Any refusal to consent to the processing will result in the impossibility of making a response to your request. Any further purposes related to marketing activities (the sending of advertising and/or promotional material) will be subject to specific and separate consent. The above processing is entirely performed digitally but processing in paper form is not excluded. Your data may be communicated to persons considered recipients pursuant to Art. 4 or to data processors pursuant to Art. 28 of the (EU) Regulation, in charge of functions designed to respond to the request you have made to us. 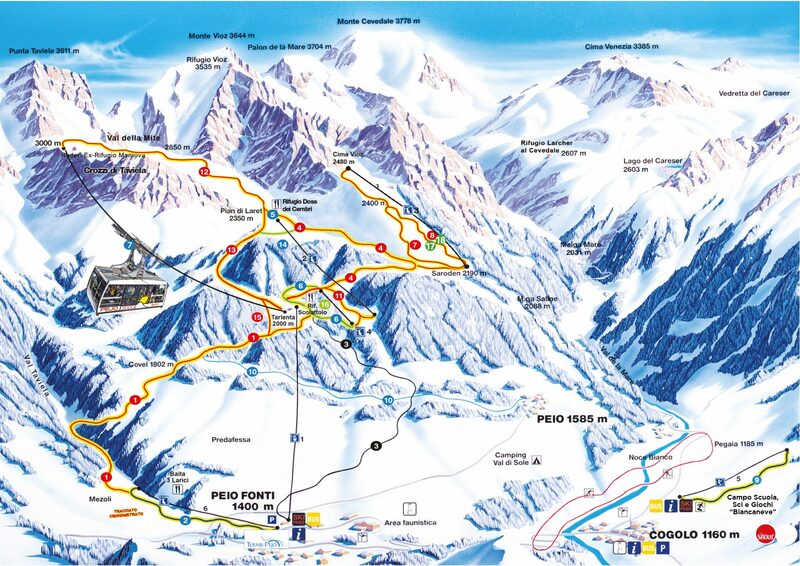 Pejo Funivie S.p.a. ski area is equipped with webcam installations. Panoramic images are used only for tourism purposes and transmitted via the Internet through the www.skipejo.it website. Your data will in no way be transferred to third countries outside the EU or to international organisations, nor will it be saved on servers located in a third country. The Data Controller does not in any way use automated decision-making processes regarding your personal data. At any time you have the right to request the Data Controller to access your data, as well as to correct or delete the same. You will be given feedback within 30 days in writing (unless you specifically request oral feedback), including electronic means. You also have the right to request limitation of the processing or to oppose it. You can also request the portability of your data to another data controller. You may also revoke the consent given on this website at any time. To revoke one or more of the consents given, simply contact one of the above addresses. If you believe that your data has been processed unlawfully, you have the right to contact the Supervisory Authority to make a complaint.